In August 2010 a group of like - minded people from Yateley FC came together to discuss how they could raise significant sums of money to develop facilities for football, and where possible other sports, in Yateley, Hampshire. The spur to this initial meeting followed discussions with a local school around the possibilities of developing an underused and poorly drained school playing field for joint use by the club and the school. Disappointingly these discussions failed to mature into actions, principally because the school felt the club would be unable to raise the necessary funds to develop the land. Undeterred but learning from this setback the group continued with developing ideas for fund raising. With the sums of money needed to realise our dreams it was clear that traditional fund-raisers such as car boot or jumble sales would simply not be enough. A different and larger scale approach was needed, and so, following an idea tossed into the mix, the Yateley Music Festival, subsequently marketed as the ‘Gig on the Green, Yateley’ was born and with it the Yateley Sports CIC. Then followed 10 months of researching, budgeting, planning, booking of bands and seeking sponsorship by the team who, though all volunteers, were also professionals and this professionalism has been reflected in the first and subsequent years of the successful Gigs. Not that all was plain sailing, far from it! Once the first Gig was announced a handful of vociferous objectors appeared vehement in their opposition to this new event for the town and publicly announced their fear that if this was allowed to take place “Drink and drug fuelled youths would rampage through the town destroying all before them!” Fortunately once the details of the festival had been explained to the community, and in particular to Yateley Town Council e.g. that the targeted, and therefore anticipated, audience would be families and that a high level of security and general health and safety would be in place, such objections were easily and quickly overcome. A pair of important principles were set by the team in the creation of the festival. Firstly, that it should be affordable and secondly, it should wherever possible use local business, at competitive rates, as suppliers. Thus the fencing, security, stage, sound, lighting, signs, printing and even the portable loos all came from suppliers within a 20 mile radius of the town. Marketing the event was particularly important as nothing like it had ever been held in Yateley before and so commenced a campaign on social media and the more traditional approaches of strategically placed banners along with the printing and distribution of around 45,000 leaflets. All of which certainly created an awareness of the event but there was still a lot of suspicion as to just what it was! Our approach to the music was to have something for everyone from teenagers to grandparents. The festival started with school choirs followed by a local singing talent show ‘The Y Factor’ for three age groups of children. Then local bands took the stage through until the evening when a variety of tribute bans took over with ‘Oasish’ headlining the first festival. The first year was a stunning success both from the number of our community who came along and enjoyed themselves, an estimated 2300, but also financially. This success was recognised later that year when the CIC was awarded the ‘Best New Business of the Year’ award presented by the North Hampshire Inspire Awards. The success has continued each year and the crowds have swelled as news of the festival spread. In 2014 as a result of this success a second day was added and in 2018 the Saturday attracted a crowd of 4,800 with a further crowd 2,000 enjoying the Sunday. Which also resulted in an increase in significant funds being raised. During the past nine years football has also developed in Yateley with in June 2013 the coming together of four football teams to form Yateley United FC. This club now has 25 youth teams and 5 adult teams together with a growing Walking Football group and today provides sport for 4 to 81year olds. 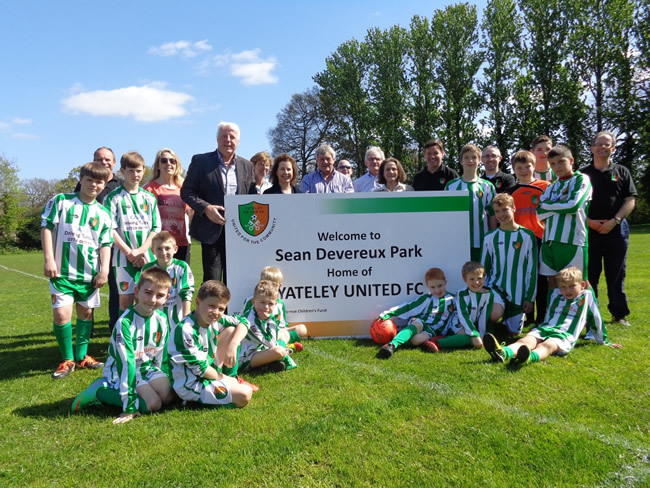 For a number of years these teams, under the auspice of their previous clubs, had played on the Yateley Town Council leased and managed playing fields of Sean Devereux Park, Yateley. This land, previously gravel pits subsequently filled and landscaped, has been under lease for several years however, if the club wanted to develop the park for sport in terms of floodlighting, club house, training facilities, etc. it would require a new long lease or to own it. Following discussions with the owners of the land it was found that they were willing to sell and, as a direct result of the funds raised from the Yateley Music Festivals, the CIC has been able to provide the funds to buy it. In turn this enabled both Yateley United FC and the Yateley Cricket and Hockey Association to purchase their own share of the park. Plans are in place in 2019 to commence the development of the facilities at Sean Devereux Park and create a ‘Community Sports and Wellness Centre’ not just for sport but as an important addition to the health provision of the wider community. Looking to the future Yateley Sports CIC are already discussing Gig on the Green 2020 plus researching and planning a further significant event for our community to enjoy and benefit from. We are highly appreciative of our volunteers and the outstanding work they have done and continue to do for our community, more volunteers are always welcome.